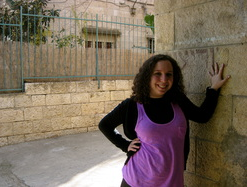 Mrs. Freidy Yanover will join the Mayanot Women’s Program in Jerusalem as scholar in residence for the summer semester. The Mayanot Institute of Jewish Studies is excited to welcome a renowned lecturer and Torah educator as the new Scholar in Residence at the Mayanot Women’s Program, in Jerusalem. The distinguished Mrs. Freidy Yanover will be joining the program after Pesach this year and teaching throughout the summer program. Mrs. Yanover is a prominent teacher at the Beit Chana Institute, and a worldwide lecturer. She is well-known for her charisma, depth of Torah knowledge and her ability to teach the esoteric concepts of chasidus in a contemporary and relevant fashion. 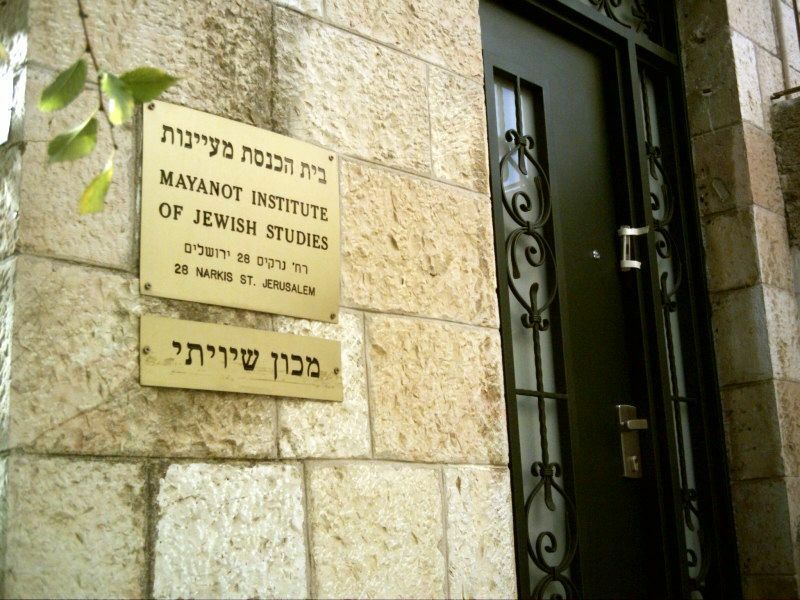 The Semester Scholar in Residence Program is a great new addition to the roster of programs the Mayanot Institute of Jewish Studies is initiating. The program is part of an overall effort to enhance the quality of education, to even greater scholastic heights, through curricula development, networking and unique educational opportunities. Interested students can contact us at wp@mayanot.edu or check out our website www.mayanot.edu for more information on joining our 2017 summer program this year. 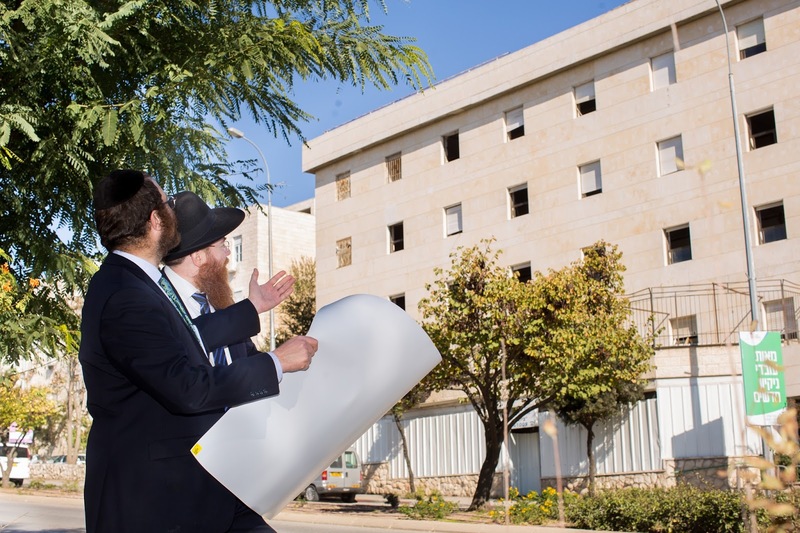 In the mid 1990’s, in Jerusalem, Rabbi Shlomo Gestetner and Rabbi Kasriel Shemtov were shluchim – emissaries of the Lubavitcher Rebbe ob’m, sent to determine what could be done to impact today’s generation of students. Both seasoned educators, they were not satisfied with the state of Jewish education for college students visiting Israel. Though there was an abundance of programs, they did not fully encompass the vision of a holistic Jewish education that would speak to the next generation of youth. Rabbi Shemtov remarked, "There didn't yet exist a place that was inclusive of people on their journeys toward Judaism, a center for Torah learning that offered an opportunity to inspire one's surroundings and not retreat from the world." The educational institution they imagined would be a place where young Jewish adults could engage with their history, heritage, and the classical texts of their religion in an authentic, open and accepting environment. It would be a place where intellectual engagement with Judaism would be emphasized, where close textual study, coupled with challenging discussions and questioning, would be encouraged. It would be a place where students would be welcomed regardless of their level of observance, as long as they came with a keen and curious mind, and a dedication to explore their Jewish heritage. Inspired by chasidut, their belief was and still is, that Judaism is a living entity that should not exist only within the confines of the classroom but should resonate beyond; their studies, discussions and questions should inform their daily lives. 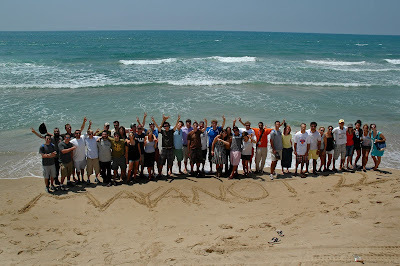 The name ‘Mayanot’ was chosen, based on the verse, “Let thy wellsprings be dispersed abroad.” (Proverbs 5:16), and captures the essence of this vision –that the students gaining a deep and enduring knowledge of our heritage, and becoming leaders in their home communities, utilizing what they had learned at Mayanot. Ultimately, they would enrich their Jewish communities and beyond. 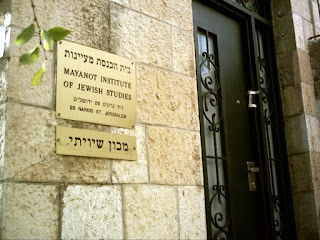 The realizing of this vision was finally put into action in 1996, when the Mayanot Institute of Jewish Studies was established in Nachlaot, Jerusalem. Rabbi Gestetner, Dean of Mayanot, and Rabbi Shemtov, the Executive Director, approached a well-known philanthropist, Joseph Gutnick of Melbourne Australia to be a partner in this venture. His financial support, in those first years, were critical to the success of Mayanot. Founding teachers included renowned Talmud lecturer Rabbi Baruch Kaplan, contemporary Halacha lecturer Rabbi David Fink, Ulpan teacher Mr. A. Atzmi and Rabbi Dr. Allon Silberg. All are extremely talented educators, who are able to help students just beginning, to understand and study complex sections of the Gemara independently, and were a perfect addition to the yeshiva. Mayanot’s first year began with seven students. Through word of mouth, Mayanot’s reputation grew, and so did its student body, increasing by 50% each year. As the demand to study at Mayanot grew, so too did the number of programs, to cater to the vast and various needs of the students. Rabbi Yisroel Noach Wichnin became the Rosh Yeshiva of the Mayanot Yeshiva program. 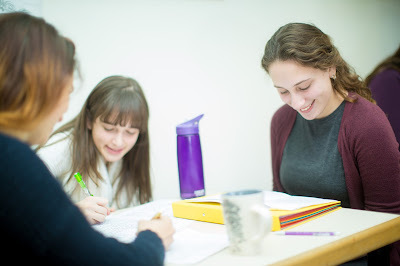 Under his guidance, the curriculum developed to the extent that a student could come to Mayanot just knowing the Hebrew Aleph Bet, and graduate with new vistas of knowledge and tools for self-study. At this point Rabbi Chaim Moss joined as head of the ‘Judaic Studies Program’. This program was designed for students who wanted to gain an introduction to the classical texts of Judaism. 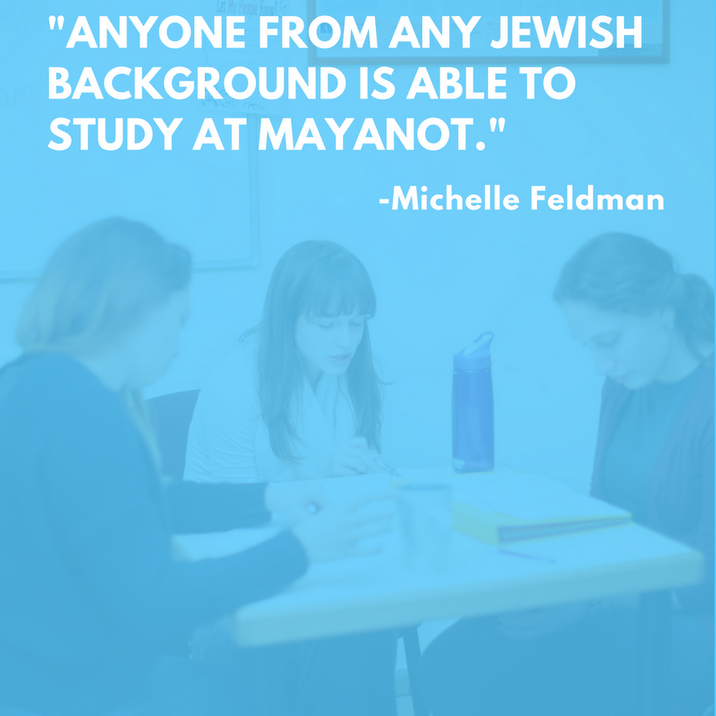 The Mayanot Winter and Summer Programs, offered through the JSP program, were designed to allow students to spend 4-5 weeks exploring the issues that have challenged Jewish thinkers for centuries, in an intimate and intellectually open environment. These short term programs were designed to appeal to students from all over the world who want to study at Mayanot during their school breaks. As these programs developed, the Mayanot Executive Learning Program was added. 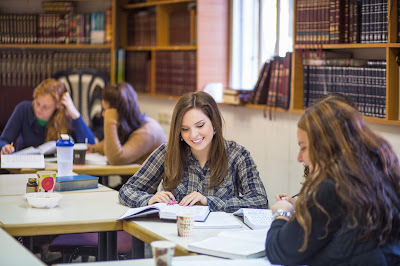 Designed for professionals and business executives, the course enables busy professionals to advance their Jewish knowledge and recharge their spiritual batteries. As the Mayanot family began to grow exponentially, it became clear that the community they had founded needed a space outside of the Institute’s walls to gather and to unite with the wider community. In order for the conversation to continue, it had to include more voices. In coordination with the Mayanot board, and guided by the Chairman of the Board, Mr. Jeffery Cohen, the Mayanot Community Synagogue in Nachlaot was established. Mr. Cohen has been a guiding light in all Mayanot activities and developments. He offers a hands-on approach. With his help, the Synagogue offers people in the area an opportunity to participate in lively, meaningful services and to take part in the many events and lectures hosted there by the Mayanot Institute of Jewish Studies. 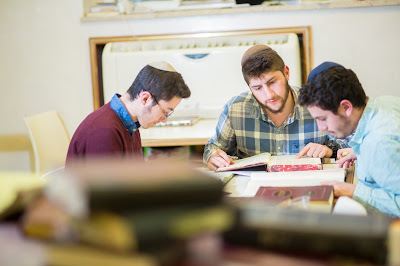 Led by Rabbi Avremel Silver, the Mayanot Alumni Shul in New York, opened in 2008 and serves as both a place of prayer and a meeting space for former Mayanot students. 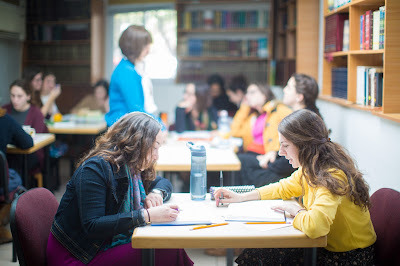 This Shul is a space where alumni can stay connected to each other and reinforce the values instilled in them at the Mayanot Institute of Jewish Studies in Jerusalem. In 2001, still more voices would be added to the conversation. The diversification and development of the Mayanot vision found expression in a partnership with Birthright Israel. When Birthright Israel was launched in 2001, Mr. Yisroel Schulman, Esq. a longtime friend and supporter of Mayanot, brought this initiative to the Board. 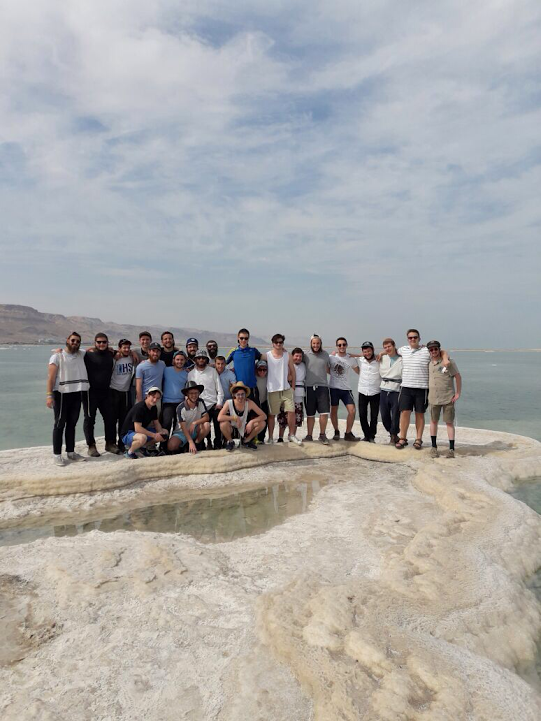 Since that time with Mr. Danny Sack, director of Mayanot's Birthright Israel division, today Mayanot is proud to be one of the largest trip providers for young Jews across the United States. 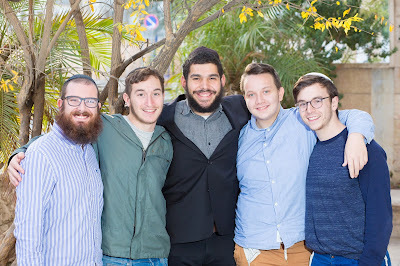 Mayanot brings local campus Rabbis to Israel to accompany the participants on their trips, and to make sure that they have a means to stay connected to Israel and their Jewish heritage back home, becoming active community members and advocates for Israel on their campuses. In this way Mayanot ensures that the Birthright Israel journey continues, establishing an effective Post Birthright Program. When Mayanot observed the Birthright Israel participants’ powerful longing to deepen their relationship with Judaism and Israel, the Mayanot Post-Birthright Study Program was created. The program presents Birthright Israel participants with an opportunity to extend their stay in Israel for an additional three weeks. In this way, participants are able to engage with Israel in a different way. 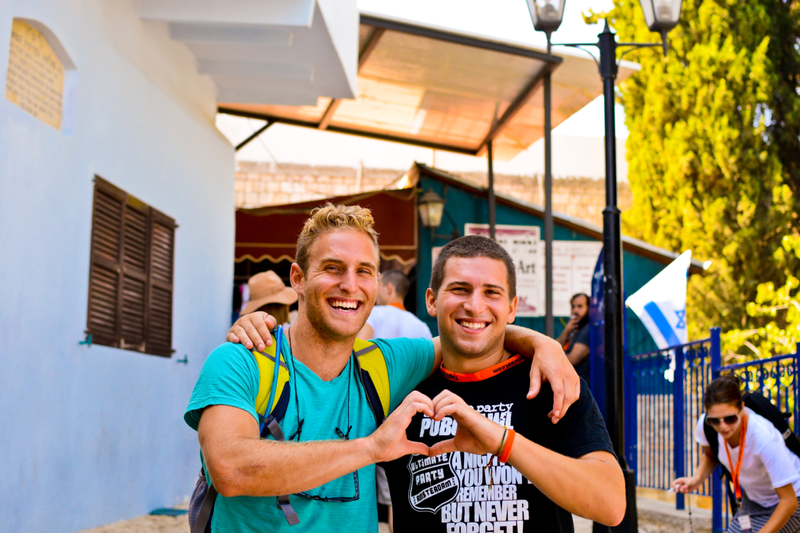 They spend three weeks studying at Mayanot and living in Israel, forming a more personal relationship with the land and with their heritage. This supplementary program to the Birthright Israel trips allows Mayanot participants a well-rounded and personalized Israel experience. In 2002, a larger building became necessary to accommodate the abundance of students who were coming to study at Mayanot. 28 David Yellin Street in the Mekor Baruch neighborhood of Jerusalem became Mayanot’s new home. It was purchased to provide a campus that included space for classrooms and dormitories where the students could learn and live, allowing for an integrated Mayanot experience. The David Yellin campus was expanded further in 2003 and 2011 as a response to the ever- increasing student population. Gradually, Mayanot began to offer a wider variety of programs, such as the Mayanot Spanish Program and an Israel Advocacy Program in conjunction with the David Project. 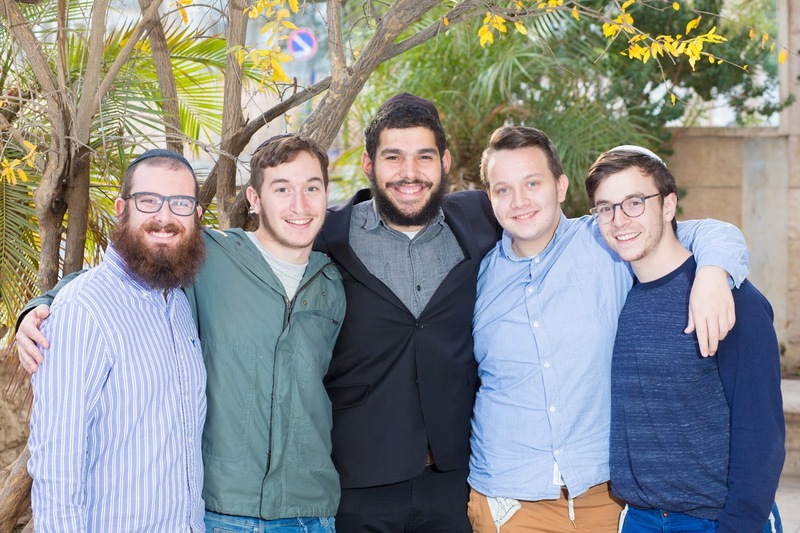 The David Project trains Mayanot students to become ambassadors for Israel when they returned to their colleges, and inspires them with a sense of the importance for Israel advocacy. In 2008, the conversation added still more voices. 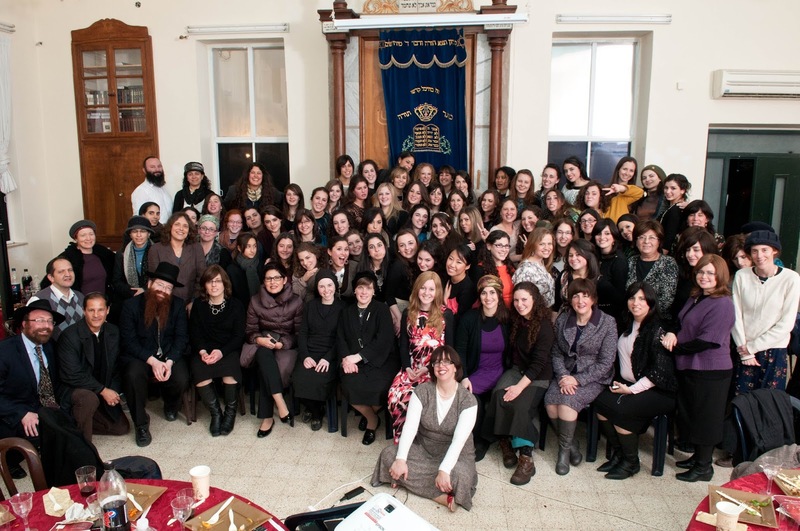 With the encouragement and support of Rabbi Moshe Kotlarsky, and Mr. Jeffrey and Mrs. Karen Cohen, the Mayanot Women’s Program was established in Katamon. This dream was made into a reality by Mr. George and Mrs. Pamela Rohr, the first investor in this new venture. Mr. Rohr was not content with just funding the program but constantly contributed and followed its success and growth. Headed by Rabbi Meir Levinger, Educational Director, and Mrs. Rivka Marga Gestetner, Assistant Director, the Mayanot Women’s Program quickly became a well-known destination for women in search of a place to explore and express their spirituality and to undertake rigorous study of Jewish texts. The Women’s Program has become the fastest growing program of its kind in Jerusalem. The addition of the Women’s Program has added a vital and rich element to the Mayanot tapestry. The Post High School Program was launched in 2015, headed by Rabbi Mordechai Guth introducing a new track for 18 -19 year old's who want to experience authentic Torah learning with a Chassidic spirit. Yet again Mayanot has found it necessary to expand into a larger building, due to the overwhelming popularity of the many programs offered. The new Mayanot World Center will reach an even wider audience of men and women and broaden the impact worldwide from the heart of Israel’s capital. The magnificent five story building, on 7 Ben Tzvi, was officially purchased in 2016 and will be the new headquarters of the organization, housing several new initiatives including: the Birthright Israel extension program, the lone soldier residential center, the post high school beit midrash program, internship and volunteer programs and so much more. With the overwhelming support from the broader Jewish community, we are able to infuse the lives of students with a passion for Israel and the Jewish people. We look forward to sharing many more milestones together with you! Looking back to the end of last year’s Pesach seder, I never realized “Next year in Jerusalem” would actually come to fruition. This year, spending Passover in Israel and with Mayanot, I will be asking a 5th question, “How is this seder different than seders from years past?” and I’ll have a lot of answers. Pesach has always been my favorite holiday but this year it is on a whole new level. I’ve spent the past three months learning at Mayanot Women’s Program. The past few weeks have been “Pesach boot camp” and I have loved every second of it. I feel like I’ve actually prepared for the holiday, for the Exodus. In years past, I’ve always been distracted with the cleaning, the food, the Seders, the fun of Pesach, all of the external, “written” parts of the holiday. I actually never really thought about the true meaning of the holiday itself. I would skim over the Haggadah and read the words but I would never process the story. This year is different. In Ulpan, I learned the actual meaning of the words in the Ma Nishtana and Pesach songs. In Halacha, I learned the laws of Pesach given to us directly from the Torah. In Talmud, I learned Gemaras on the holiday. In Chassidus, I learned about the deeper meaning of matzah and the four sons. In niggun class, I learned Vehi Sheamdah. We even had a mock Seder! So this year I’m coming with my bags packed full of knowledge, ready to leave Egypt. There’s no way I will miss the story ever again because now this knowledge has been engraved into me. I find it fascinating that the theme of Pesach is freedom when at times it seems so restricting. When Moshe brought down the the Ten Commandments from Mount Sinai, they weren’t just written onto the two tablets, they were engraved into them. They were etched into the physical tablets so they would literally become a part of them. Not by coincidence, the Hebrew word for engraved and freedom are spelled exactly the same, just with different vowels. This comes to teach us that Judaism is externally written on us and cannot be chipped or smudged away. It can feel burdensome at times because the letters on the exterior are separate from the actual person within. However, when a Jew engraves themselves internally with their Yiddishkeit (Judaism), so it becomes “who I am”, that is the ultimate redemption. To know that Yiddishkeit is etched within my being so I cannot only, never be separated from it, but I am defined by it, that is the ultimate redemption. So to with this year’s Pesach I feel like all the learning, all the spiritual preparation we have done at Mayanot has truly allowed me to etch the answers, the feeling of freedom and the meaning behind Pesach on my heart. L’chaim my friends to being engraved this Pesach! May we all merit to feel an internal freedom and a literal freedom with the 5th cup of wine and Moshiach! Program in Jerusalem for the three week winter program where college students all around came to join the young adults that had already been at Mayanot. I arrived at what I thought was a small building, but walked inside and noticed that not only was it a small building, but it was a place where everyone was smiling and every student there was learning. Despite the size of the building, it was filled with big smiles, big hearts, and one big family. As soon as the program started picking up pace, I was exposed to some great learning opportunities I would never have come across in my life. I picked up the Mishnah and the Gemara and started to break them down and figure out what the ancient texts have to say. I learned about the weekly parshah (Torah Portions) and was able to relate it to my life. 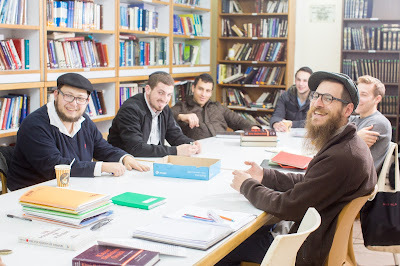 Mayanot’s education is based on a Chassidic approach, which is the teachings of Judaism by the Chabad Rebbe’s. It is also based on subjects that are pertinent to ones lives. When it came time to pick up Tanya, the psychological bases of Chassidus, I had found my passion in Judaism and I began to learn it on a daily basis. Mayanot is such a supportive environment and it doesn’t matter where you come from. Some girls had very little Jewish foundation, while others like me had a strong foundation and were starting to find where in Judaism they wanted to go. 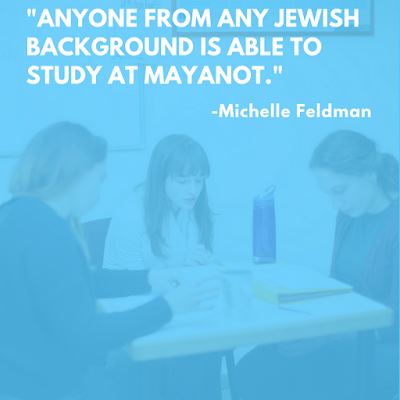 Anyone from any Jewish background is able to study at Mayanot. It’s not all study, but also about building life long friendships and making memories. I was exposed to so much of Israel, not only the religious parts, but also the secular parts. 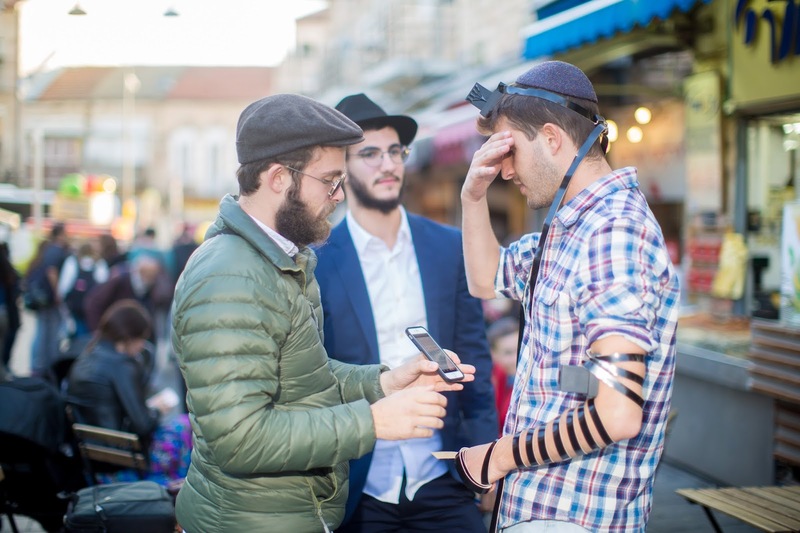 I was able to be Jewish and not be afraid of being observant openly in Israel. 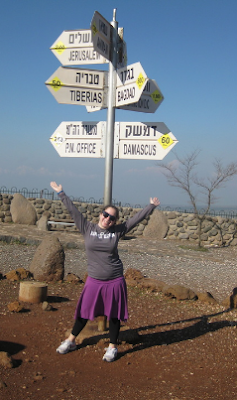 My favorite experience from the trip was when we went to Tzfat in the North of Israel for the second Shabbat. Our Shabbat hosts were families who were affiliated with Mayanot and had chosen to spend their Shabbat with all the women on the program! We were fabrengening (a late night discussion period of in depth conversations and singing) with them till around 2am on Friday night. Everyone was intrigued and connected to what we were hearing. At one point everyone got out of their seats and started singing and dancing and it was as if the whole room had been transformed, and it was very visible that everyone’s neshamah (soul) was happy. I was sad to leave Tzfat, as I knew I only had a few days left at Mayanot. During my last few days, I learned all I could learn and was able to discuss with my peers. As I reflect on this incredible experience, /I think about all the good times I had and all that I have learned. I have grown so much and have acquired so much more knowledge that I hope to share with my fellow peers. If it wasn’t for Chabad at UCF and the strong support of Rabbi and Rivkie Lipskier, I would not have had this incredible opportunity. I cannot wait to go back to Mayanot some day soon and continue my learning. Written By: Michelle Feldman, Mayanot Women's Winter Program Alum, 2013.